They tried to delete this graph in August, 2012 – and they also attempted to corrupt it on January 18, 2011 – before they got caught by me. Why Has This Data Been Deleted From The NASA Web Site? By the year 2000, NASA was already very busy tampering with the underlying data. They published data in 2000 showing that 1934 was only 0.25C warmer than 1998. The data was originally located at the link below, but they have since deleted it from their disk. Fortunately John Daly captured the data before the NASA FOIA scientists had a chance to destroy it. Between 1999 and 2000, the gap between 1934 and 1998 dropped by more than 50%. 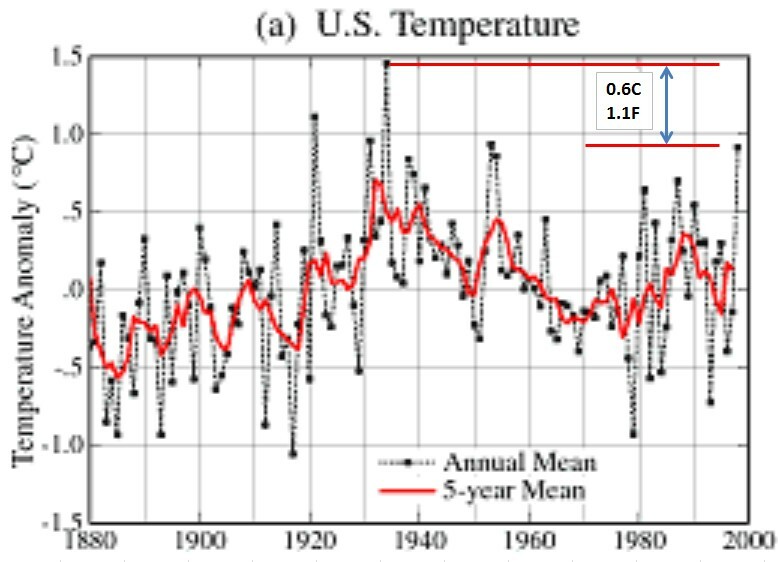 NASA now shows 1998 much warmer than 1934. The hackers and tamperers at NASA and NOAA are working overtime to influence US policy by generating fraudulent data. Links to the NASA/GISS website don’t seem to be working at all at the moment. Indie would shoot him for wearing that hat. And NO, that is not a threat, jimmy. The habitus of Hansen grossly violates trademarks associated with Homer Simpson, too. Just heard the ABC(Australia)reporting on the IPCC meeting in Hobart,saying,Rajendra K. Pachauri says the latest Heat Wave in Aus.is proof that Climate Change is for real.I say BS.I have been keeping an eye on Temps here in Cooroy Qld for the past week or so and the highest temp here has been 36.deg. C.I remember about 15 years ago jumping on a plane to Melbourne Victoria on Xmas eve and landing at Tullamarine airport where it was 43 deg C at 11.00 AM.By 5.30.PM the temp was 18.5 deg C.Fact,no BS.Climate Change is all about MONEY. Winston Smith, in Orwell’s famous book 1984, was employed to carry out exactly the same thing that NASA and other climythologists are doing: Changing continuously historical records according to the changing wishes of Big Brother. We are in 1984.